This event has already occurred. A motor coach tour to Iowa City and the University of Iowa is being planned for October 21, 2017. Please call 515-244-1888 for more information. The Iowa Architectural Foundation is offering a day-long architectural tour of some of the world’s most famous Prairie School Architecture on November 5, 2016, by motor coach from Des Moines to Mason City. Guests will hear a presentation on Prairie School Architecture and its architects on the trip to Mason City. They will have lunch and a tour of the Historic Park Inn, the only remaining hotel in the world designed by Frank Lloyd Wright, led by Bergland Cram, the architects who completed the hotel’s restoration in 2012. After lunch, guests will tour Rock Crest – Rock Glen Historic District, the largest collection of Prairie Style homes surrounding a naturalized common area. 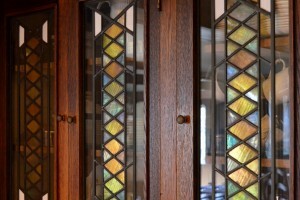 The tour will visit Wright’s Stockman House and Interpretive Center and then have the special opportunity to tour two private homes rarely open to the public: the Blythe and Melson houses, both designed by Walter Burley Griffin between 1911 and 1913. All tours will be led by design professionals. Cost: The cost of the tour is $140 per person, which includes bus transportation, snack, lunch at the Park Inn Hotel, admission to four buildings as well as curriculum presented on Prairie School architecture during the trip. Or call Claudia Cackler at the Iowa Architectural Foundation, 515-244-1888 or email director@iowaarchfoundation.org. Reservations will be confirmed when payment is received. Cancellation: Cancellations received through 4:30 PM, Thursday, October 20 will receive 50% refund per person. After that time, cancellations will not be refunded, but may be transferred to another party.